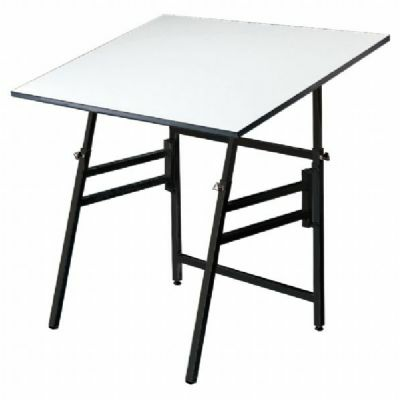 Home > Drawing Supplies | Drawing Tables & Art Tables | Alvin® Professional Table, Black Base White Top 36" x 48"
The Alvin Professional-Blk Base W/36X48 is a truly portable, durable table for your drafting and graphic design projects. Alvin® Professional Table, Black Base White Top 36" x 48" Featuring a slim, yet sturdy, design, the Alvin Professional-Blk Base W/36X48 is a drafting table that folds to 4” for easy storage and portability. The warp free Melamine top can be adjusted from 0 to 45º angle to create the perfect workspace. The table height can be adjusted from 29” to 45” to accommodate your work style. Choose from a white or black powder base finish on the base. The table also features non-skid self-leveling feet so that your workspace is always in the correct position. Base is constructed from 1” square steel tubing to keep the unit light. For orders of 25 or more tables, custom base colors can be selected. This table does not include a pencil ledge. Oversize Shipping for this item is $105.95. For durability, versatility and portability, the Alvin Professional-Blk Base W/36X48 is the perfect table for your work projects.